If you will be driving children across town or across the country you want to transport them safely. Consider the following tips so you will have safe travels to any destination. Each state has their own regulations regarding how children should be restrained when riding in a vehicle. Verify you are aware of the regulations for your state. The Governor's Highway Safety Association provides a list showing the differences between states. Most states require three different levels of restraints based on the height, weight, and age of the child. Typically, children under the age of one and under 20 pounds are required to sit in a rear facing car seat with a five point harness. 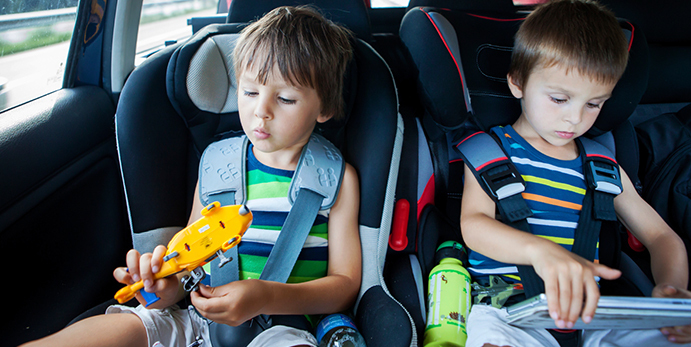 Toddlers and preschoolers can sit forward facing, but will still need to use the five point harness. In most states young children utilize a booster seat to get them to the right height to safely wear the regular car seat belt. Be sure to examine the specific height, weight, and age regulations for the child you will be travelling with before you depart. In addition, most states require children under a certain age to sit in the back seat of the vehicle. The child restraint and location regulations are based on studies of crashes and are intended to protect children from injury or fatality if an accident occurs. Abiding by these laws are mandatory to prevent a fine and to prevent a potentially tragic situation. The National Highway Traffic and Safety Administration recommends children under twelve sit in the back seat of vehicles with front airbags as the airbag can cause serious injury to young children. They emphasize that children in rear-facing car seats should always be placed in the back seat, especially in vehicles with side airbags for the front seat passenger. Airbags that prevent injury for adults may be the cause of injury to young children and to babies in rear facing car seats. If a second adult is in the vehicle, designate that person in charge of all children. It will be their responsibility to keep the children happy and entertained. If a child has dropped a toy or needs a snack, the second adult will provide the needed aid. If no second adult is present consider nominating an older child for this role. If no other adult or older child will be in the car, plan ahead accordingly. Place snacks and entertainment within reach of each child so they can meet their own needs. Ciao Bambino recommends taking a trip to the dollar store ahead of time. Wrap up some plastic toys, games, and books to give as new little gifts during the trip. When traveling with children don't assume you will get where you are going quickly. It is best to plan plenty of time to reach your destination. If the children are not behaving properly or have a need you can't fulfill safely, stop the car. Taking a break is sometimes all that is needed to make the remainder of the trip go smoothly. In some cases it may not be a good time to stop the car. The next exit could be miles away. Turning on music or opening the windows may be the change needed to distract the children, and will allow the driver to continue focusing on the road until they can stop safely. Following the above tips will help ensure you successfully transport children without any issues. Be sure you review the laws specific to your state before you drive a child in your vehicle.